I make no secret of the fact that I like the Mazda MX-5. I owned one for two years and it was a pleasure to hop into it each day even for the mind numbing drive to work, and when weekends came it was sheer hedonistic joy. Other manufacturers should take heed. Since my MX-5, which was a 1995 model, there have been subtle changes to the cars, but all the subsequent models have been identifiably Mazda MX-5. The latest evolution of the Mazda MX-5 has arrived with the Roadster Coupe - the first model available with an integrated electronically controlled folding roof. This was displayed at the Bangkok International Motor Show, and was my car of the show. Mazda denies that it has deviated from the MX-5’s original philosophy of creating an inexpensive, lightweight sports car with the Roadster Coupe. Instead, it says it has developed a more secure and practical alternative that will broaden the appeal of its cult car. Since mine had the hard top, I have to admit that it spent 90 percent of its time in that guise. And the main reason was the fact that it was too difficult to take off. It was heavy, needed two people to remove it, and then where did you stow it? A hassle. Mercedes-Benz was the first car-maker to blur the lines between a traditional convertible and a sports coupe with its original SLK roadster in 1997. Since then, a host of manufacturers have followed its lead, the likes of which extend from cuties like the Peugeot CC through to exclusive high-end exotics like the Mercedes-Benz SL. Mazda claims the Roadster Coupe was developed as an integral pillar of its third-generation NC-series MX-5, although it required slightly more development time than the soft-top to ensure it met the strict criteria set out by program manager, Takeo Kajima - the father of the cult car. Mazda believes the soft-top will still appeal to enthusiastic owners who appreciate its lightweight simplicity, while the Roadster Coupe will attract more discerning owners who demand the greater flexibility and security offered by the folding hardtop roof. In fact, Mazda believes, particularly now that the initial rush for the NC soft-top has been met, that the Roadster Coupe will make up 60 percent of all MX-5 sales in the future. I would have to agree. It is not an unreasonable proposition considering the Roadster Coupe not only has the convenience of the folding roof, but there is hardly any performance loss as it weighs only 37 kg more than the soft-top and it also comes standard with the luxury leather trim and high-powered Bose sound system. The Roadster Coupe costs 2.55 million baht for the manual. This represents around about 150,000 baht premium over the entry-level MX-5 soft-top. The Roadster Coupe shares the same mechanical package as the soft-top, powered by a 2 liter Mazda-developed four-cylinder engine with dual sequential valve timing that produces 118 kW at 6700 rpm and 188 Nm of torque at 5000 rpm. Located behind the front axle for 50:50 weight distribution, the engine drives the rear wheels via a six-speed transmission. The drivetrain is cradled in a stiff transmission tunnel that is derived from the RX-8 for greater rigidity. The suspension has been slightly tweaked to cater for the weight increase, with a larger front stabilizer bar and retuned rear springs and dampers. But it’s the roof that really sets this car apart from its soft-top sibling. 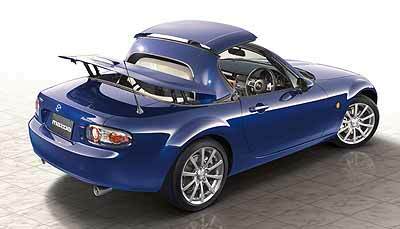 It only takes 12 seconds for the car to morph from a roadster into a coupe - which Mazda claims is the best in the business - and, having been developed as part of the program from the outset, is the first of the folding roof cars to not impede on the boot space when the roof is down. Mazda claims the Roadster Coupe still provides the full 150-litre boot capacity in either configuration. The three-piece roof is constructed from a fiber/plastic composite outer skin and high-strength glassfiber-reinforced polypropylene inner panels and is just 20mm thick and weighs only 18kg more than the soft-top roof. The extra weight is courtesy of the four electric motors, steel, rather than aluminium, bootlid and structural reinforcements required. It is controlled by buttons on the top-center section of the dashboard, and can only be activated while the car is stationary. Visually, the Roadster Coupe only differs in the rear section of the vehicle, where the decklid is 40mm higher, resulting in redesigned rear guards and a tapered bootlid to ensure the overall design remained fluid. It comes fully-loaded with a long feature list that includes air-conditioning, power windows, a six-CD Bose sound system, cruise control, dual front and side airbags and dynamic stability control and traction control. And I want one! Last week I asked which member of the British monarchy had a Jaguar Mk VII upgraded to Mk IX specs by the factory? It was the late Queen Mother for all the royals watchers. So to this week. And we are still in Jaguar territory. In 1978, the XJ 3.4 could be purchased ex-works for how much? To the nearest thousand pounds will be fine! What did we learn from the Bahrain GP? Well we can see that that Lewis Hamilton’s previous performances were not just luck. He drove magnificently and definitely eclipsed his much vaunted team mate, two times F1 champion Fernando Alonso. As you would expect, the British media is going berserk with a contender to the throne at last (as opposed to the ‘pretenders’ they have been boosting in the recent past). This young man is a real talent. What is more, he is well spoken and quite humble. This is someone that the British press can adore, with good reason. Of course, we should not overlook Massa’s performance. It was a winning drive right from the start. Flawless and fast, again eclipsing his much vaunted (and apparently very expensive) team mate Raikkonen. At no stage during the afternoon did the Finn display any real hunger for position, and his performance at the post race conference was soporific. Mind you, if he was going to sleep, he did manage to wake himself up by picking his nose, but his monosyllabic mumbles were for the main part incomprehensible. Alonso did not drive like a world champion, and being passed by Heidfeld in the BMW must make Ron Dennis wonder if he spent his money wisely. His words at the post race conference said it all for me, "You always start the race believing you can win but after six or seven laps I knew that it would be tough. I couldn’t keep up with the Ferraris and Lewis (Hamilton) and in the end had to settle for fifth." Champions do not "settle for" low positions in my book. Champions keep trying till the end. Heidfeld drove like a man determined to make the right impression. His contract runs out at the end of this year, and so far, BMW has not indicated whether they will take up the option they have on his services for 2008. It is well known that team boss Mario Thyssen leans towards Robert (le nez) Kubica, but Kubica has not delivered the performance he displayed last year. I really don’t know why the Spykers continue to enter. Their driver Christijan Albers said it all, "Even when I was running alone it was still quite tough as we had no radio." I would have to agree. At the speed of the Spykers you need something playing on the radio for company and to stay awake! Two drivers who did deserve something better were Red Bull’s Webber and Coulthard. Webber, with true Aussie forthrightness saying, "The car had an open fuel flap in the second stint, which was the same problem we had in Australia. It’s bloody frustrating." Coulthard, who drove like he’s been on rejuvenation pills said, "We’re going through some growing pains at the moment, but we will get through it and we’ll be stronger on the other side, everyone’s working very hard back in the factory." Two drivers who did do much better than expected were Davidson and Sato in the Super Aguri’s. A team which has come from nothing to run as high as 6th at one stage. However, the Honda engines proved a little too fragile. Honda is not having a happy 2007 at this stage. The next GP is in Spain on May 13. Will Hamilton eclipse his Spanish team mate on his home soil? Will Honda be able to beat Super Aguri? We shall see! Read all about Jaguar here! Having mentioned the late British Queen Mother’s Jaguar Mk VII, it was certainly coincidence when our Malaysian resident automaniac John Weintnhal brought the information on the Jaguar magazine to my attention. Specialist publishing company Hughes Graphics and Design has unveiled their new look Jaguar Magazine and website as they embark upon concentrating further on the American and European magazine market. 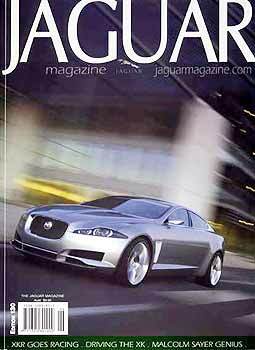 Jaguar Magazine editor, Les Hughes, said the re-fresh has included the www.jaguar magazine.com website in the aim of bringing readers the very latest and best information on the marque from around the world. "The internet is such a vital component of every business that we have tried to make the Jaguar Magazine website an extension of the publication rather than an advertisement pushing people to buy a copy," Mr Hughes said. "The decision to aim the magazine into America is a very simple one - Jaguar sells around 50 percent of its new cars there, so it provides a great opportunity for us to reach many more people who share the same passion for the marque." Adding to the style changes, Jaguar Magazine has created a close relationship with Apex Racing to feature their competition efforts with a team of new XKR Jaguars in the growing FIA GT3 Championship throughout 2007. Jaguar Magazine also has a very close association with the factory and Jaguar Daimler Heritage Trust, and will bring readers all of the latest models and details as they occur. "I am very excited about working with the team at Apex Racing, including team principal Richard Lloyd, to cover its FIA GT3 racing, because Jaguar had such a legendary history in sports car racing, and I believe we will see it again," Mr Hughes said. "On top of the coverage in each edition, our website will feature exclusive insights into the team operations, team members and drivers, and updates on all of their races. We will also be provide profiles on team members, and really give readers an understanding of what goes on beyond the glitz and glamour of on-track activities." Mr Hughes said it was important to emphasize to existing readers the quality and nature of stories is not about to be altered with the design. "We have always prided ourselves on providing the very best stories and designs in our magazine, and this new branding is simply the next phase in continuing this," Mr Hughes said.